Living in the country brings a lot of benefits. Great internet access is not one of them. We are too far from the telco switch station to get DSL, and let’s face it, the telco is no longer investing in their wired infrastructure. Nor would most DSL speeds any longer be adequate. Hence, out of luck there! From originally being a non-techie house it has become a smart-house where every light switch and every outlet is controlled by a Z-Wave house controller and multiple iPad interfaces (may be come another article later?). The backbone intranet is a gigabit ethernet network with a Mikrotik Gigabit router as the brain. This router will accept one Fiber connection, 5 Gigabit Ethernet and 5 100mb Ethernet. Each port is configurable to “whatever you need”. A mirrored 4Tb media server with 600+ movies is available to all smart TVs in the house. It also provides stored music. Two “theater” setups (55″ TV + 5.1 Surround Sound) are synchronized for when we have house parties. The same video and sound comes from all systems. Internally, we are high speed. However, from the outside we are rural and at the mercy of wireless internet providers at this time. When we built our country log home we needed a phone pole to carry utilities close to the house before the utilities would go underground to enter the building. I could purchase a phone pole from the electric company, but since Verizon owns the poles in my town, I was told I could never get phone service added to a electric pole. Don’t know if it was true or not, but we signed up for 2 years of wired phone service to get a discounted phone/utility pole put in. The basic phone service was $30 + taxes and fees per month for a local phone number, no long distance calls, but at least 911 service and incoming calls. Our cells would be used for outgoing calls. 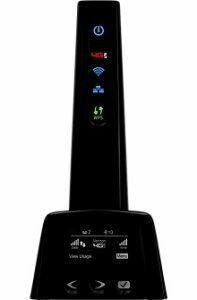 For years we have been running Verizon Cell Data connection in the form of a MiFi and later a Verizon 4G Broadband Router with Voice combo unit of house phone and internet. However, it uses the same shared data plan as our cellphones and is thus not reasonable for streaming to TVs etc. due to the high data cost. We have a 30Gig data plan to be shared between 3 cells, a house and 3 MiFi’s. We still have this and due to its “smooth” data flow (latency and buffering) it supplies internet access for all DMR access (repeaters and hot spots) as well as our mobile routers used in the vehicles or at events. The cost for unlimited house phone plus shared internet remained at $30 per month. You wonder why anyone has wired phone service anymore?? 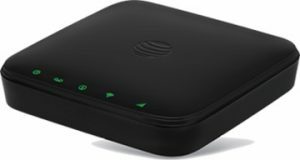 About a year ago, after numerous hours of research, hunting and pecking I discovered a AT&T service a lot of full-time RV’ers use called Wireless Home Phone & Internet (WHPI). However, all of my reading indicated that it was only available in certain regions. Consulting the AT&T website confirmed the same. A note in one of the many user comments indicated that by finding the right sales person I should be in luck. So the phone hunt started. Sure enough, I friendly female said “no worries” and the deal was on. We were suddenly online with cell-based broadband internet. 15 – 50M download speed and 5 – 15M upload (typically the higher values, but depending on number of tourists in the area). Just did an 2Gb software update on a computer with an average download speed of 49M. Awesome! 250G data per month (seems to be plenty). We average 170Gb. Effectively, we now have “broad-band” internet. Our average monthly use is about 170Gb and we have never exceeded the 250Gb allotment, even with extensive streaming of Netflix. Although the data flow is not as smooth as the Verizon service, for general house use, it is simply great! With our intranet infrastructure it is as though we have regular high speed service. Very happy with the results. Rumor is that they have discontinued the sale of the package to new subscribers. I hope not! Although each of the data access points (AT&T and Verizon) have battery backup built in for 911 purposes, I have the ability to also have the Mikrotik router configured for multiple WANs and switch from the primary AT&T service to Verizon in case of a data failure on AT&T. More to come on this. Many will ask – why not create a mesh network in the neighborhood. Yes, maybe we could with a lot of trial and error. We live along a ridge and “around the mountain” with solid forrest. No simple mesh, but more of a straight line network. We are still back to the simple fact that only two houses (mine is one) has a location conducive to LTE feed. Some other homes have satellite service (high latency, slow and metered service). The terrain would also not be conducive to house to house hops without relays somewhere in the woods. Not a simple solution. The town has committed to extend fiber to every house in the community so that all children have the same opportunity to succeed as if they live in a metropolitan area. We are looking forward to this with guarded optimism. It seems like a ambitious task to connect every household in a small rural town spread over thousands of acres and miles of country road. However, the offer is for Gigabit service for $70 per month. Can’t wait! Living at the “end of the line” has proved challenging at times. We do loose wired services (electricity and wired phone) when we least expect it. Thus, the AT&T WHPI Service may remain as a main house phone and backup internet. 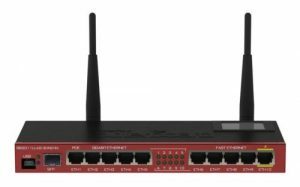 The Mikrotik router can be configured for 2 WAN and auto switch-over should the primary feed fail. Time will only tell. 2017 Fall – utility poles surveyed for height. Our private road has numerous spots with long hanging wires causing issues for construction vehicles. 2018 Spring – replacement of short utility poles started. 2019 Winter – Utility lines moved to new poles. 2019 Spring – ready for fiber runs.